I have always been a fan of eggs. Well, actually, that’s not completely true. When I was younger, I hated them until I turned 8 or 9 years old. My dad used to eat hard boiled eggs with Frank’s Red Hot Sauce for a snack, and once he had me try that, I was hooked. And to this day, it’s still my favorite way to eat eggs. But now I eat and prepare eggs many different ways. Especially since they are 0 Smart Points with the new Weight Watchers Freestyle plan. They are such an excellent source of protein and healthy fat, and they have become a staple in many of my meals and snacks. One snack that I absolutely adore is my Easy Egg Salad Recipe. It’s SO simple, uses just a handful of ingredients, and does NOT have any mayo. Sometimes, as food bloggers, we think it’s best to create unique or exotic recipes. But, in this case, I think a classic egg salad is the way to go. My version is simple – and you can jazz it up any way you choose if you are seeking a certain flavor. Use it for sandwiches, in wraps, on top of salads, as a dip for crackers, or spooned into endive leaves as an appetizer, as I’ve done here. I know that people have strong opinions about mayo, and I’m not here to diss it. In fact, I love mayonnaise! And while I do enjoy egg salad with mayonnaise, my favorite version is without it. It just feels and tastes lighter, and brighter, and allows me to really savor the natural flavor of the eggs. I use an organic extra virgin olive oil as my fat (instead of mayo) to bring it all together. And because I use a cheese grater to shred my eggs, the texture becomes light and fluffy, while still tasting rich and decadent. Look how light and fluffy that shredded egg is! This may seem like a simple task, yet you’d be surprised at how many people still wonder how to boil eggs correctly. So I’m sharing my 3 easy steps to get the best hard boiled eggs that peel easily. Place eggs in a single layer in a large saucepan. I am able to fit the whole dozen in my pan. Cover eggs with cold water by about an inch. Cook over high heat, just until boiling. Remove from burner. Cover with a lid and let eggs stand in the hot water for 12 minutes (for large eggs) and 14 minutes (for extra large eggs). Remove eggs from the saucepan, and place them in a large bowl of ice water. This helps to prevent that green edge on the outside of the yolks. NOTE: Older eggs are actually easier to peel than fresh eggs, so you’ll have the best luck with eggs that have been sitting in the fridge for a week or two. Finally, let’s talk about fine tuning the flavor! This Easy Egg Salad Recipe is my base. Sometimes, I heat things up with some smoked chipotle seasoning or chili powder. Other times, I’ll add in other toppings like diced tomatoes, dill, parsley, chives, relish, pickles, olives, bell peppers, or avocados. There’s no limit to what you can do with it! Feel free to experiment and find your favorite flavor combination. No need for mayonnaise in this simple egg salad recipe! 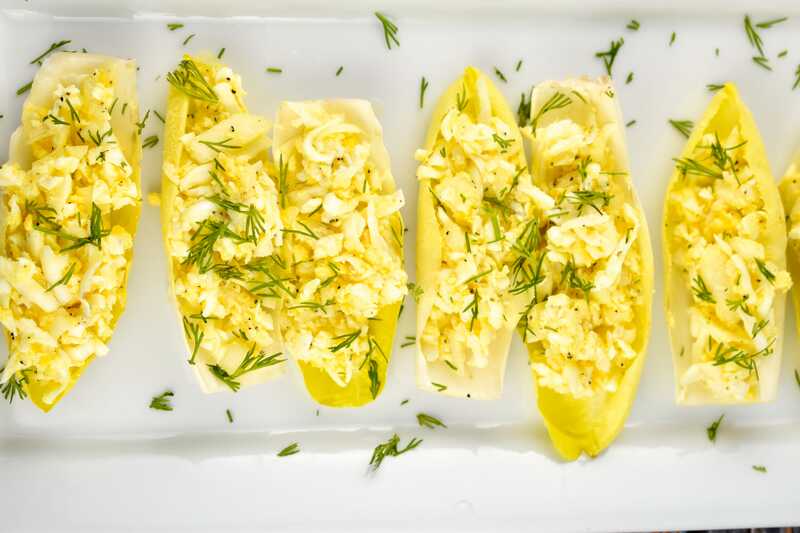 Just a few ingredients make a wonderfully flavorful egg salad that will become your new go-to healthy snack idea. Using a cheese grater, grate the peeled eggs. In a bowl, combine the eggs, onion, olive oil, salt, and pepper.